Jasper is a luxurious, modern and spacious 3 bedroom Premier duplex apartment. 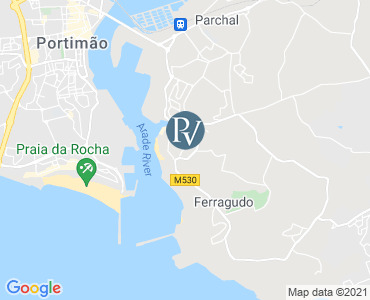 The panoramic sea views coupled with its perfect location, just 3 minutes away from a wonderful beach and a short stroll into the quaint fishing village of Ferragudo are what give this apartment its wow factor. Located within an exclusive private gated community, guests staying here can directly access the private walled grounds that are set to beautifully matured gardens, large communal pool, bar area, gym and reception services. Jasper forms part of a collection of luxurious apartments within this exclusive development. Amber and Sapphire are also available for those looking for addtional or alternative accommodation options. Apartment Jasper is a duplex unit with 3 large bedrooms, 3 bathrooms, large living areas with TV and Wi-Fi, a fully fitted kitchen with integrate appliances and a large balcony with areas to eat, sunbath and relax in the Jacuzzi. A truly wonderful apartment and location for both families or adults wishing to share and enjoy a perfect holiday experience where peace of mind is standard. The developments also benefits from enclosed parking. Enjoying sea views with a superb location at the picturesque fishing village of Ferragudo you are only a few steps away from the beach. The apartment enjoys sea views with an excellent variety of restaurants and amenities all within walking distance as well as Golf courses, tennis courts and beach activities which are easily accessible. Located just a 40 minute drive from Faro airport, Amber really is the perfect holiday destination for the most discerning holiday makers. Overlooking the swimming pool and terrace area, the reception is the meeting point and heart of the gated development. On your arrival, the friendly reception team will welcome you. They are always available for any assistance required throughout the duration of your stay. Private taxi transfers, car hire or your dinner reservation can be arranged by the reception team, a great start to a stress free holiday. The staff will also be able to make suggestions and arrangements for the best local activities and restaurants. Excursions, theme and water slide park tickets can be booked with the reception team. The Pool area is equipped with luxury sunbeds and shades. The lounge and bar which overlooks the pool is furnished with relaxing sofas. Drinks, cocktails as well as light meals are served throughout the day and into the early evening. During the summer there are themed evening activities which include live cooking shows, barbeques and wine tasting all of which takes place on the pool terrace. To enrich your holiday experience, the fitness gymnasium offers many options to keep your body fit and your mind relaxed. There are qualified instructors available who are committed to help you reach the desired results, creating or adapting your training programme with a personal training session or fitness classes. Massages and beauty treatments are available upon request. The gym is free and use is exclusive to guests, except the stretch class and circuit fit & mix that has an additional cost. Gym towels are provided. All prices are per week for the apartment only. Villas are booked from 15:00 on your arrival day (Saturday) to 10:00 on your departure day (the following Saturday). Please note that availability shown is subject to confirmation - please call our reservations team on 01243 514970.